Beijing Wangfujing Street, as one of the symbols of Beijing's commerce, is the most well-known and prosperous shopping street with modern and fashion trends. Located near the city center in Dongcheng District, the street is one of four most prosperous business zones in Beijing. It is 1,600 meters (1 mile) long ranging from Changan Avenue in the south to National Art Museum of China in the north. With a history of 700 years around, it got the name Wangfu (royal mansion) Jing (well) because there used to be eight royal mansions and a well with sweet water on the street. Currently, it is the busiest street in this city and there are 600,000 people every day come and go and on holidays, the number can rise to 1,200,000. As the first famous business zone in this city, Wangfujing Shopping Street houses a wide variety of shops and boutiques, some of which are of world-famous brands. Apart from that, there are also many time honored stores with traditional commodities standing in the street for hundreds of years. Nowadays Beijing Wangfujing Street is a modern commercial street which can be paralleled with Champs-Elysees in Paris. What to buy in Wangfujing? Here list different types of those popular stores or markets for your choice. Shengxifu, as a Chinese old brand with time-honored reputation, is a store which produces different kinds of hats. Their hats are noted for fine materials, exquisite craftsmanship and good quality. Both Chairman Mao and Premier Zhou had been their customers. The hats are keeping exporting to America, Singapore, Canada and France. As a time-honored brand, Tongshenghe is renowned for its cloth shoes and caps. With fine quality and design, the shoes are very popular in Beijing. Many celebrities in China had customized their shoes here. Visitors can also order theit tailor-make shoes here. As a time-honored silk shop, it is one of the most popular shopping sites for western visitors. There you can purchase the silk in top quality. There are traditional Chinese clothing available, especially the cheongsam. Visitor can have their clothes tailor-made in the store. Visitors just need to select the style and cloth and get their figure measured. When the clothes are finished, they can be delivered to visitor's home. Gongmei Mansion is the largest shopping center for crafts in Beijing. Inside the mall one can buy all kinds of jewelry and handicrafts. A dazzling array of Jadeite, agate, silk and embroidery are displayed for sale. Four most great figures in Beijing crafts including cloisonné, ivory carving, jade ware and carved lacquer ware all can be found here. Visitors can enjoy a discount on the Fifth and Sixth floors. The current Beijing APM in Beijing Wangfujing Street is one of the largest shopping malls in the city, located at the west end of Jinyu Hutong. It was built on the site of Dong'an Market, the first comprehensive mall in Beijing. Visitors can buy nearly all the branded stuff, like Apple electronics, Gap, Zara, Longines, Omega, Calvin Klein, M.A.C. There are also great deals of exotic restaurants. It is a tea shop with a history of over 120 years, which can be traced back to 1887. The most renowned is the jasmine tea, which is quite popular among both old generations and young people. The tea is good for regulating vital energy and soothing the nerves. The herb store was built in Yongle Reign of Ming Dynasty (1368 - 1644 AD) with a history over 580 years. There are various rare traditional Chinese Medicines, such as ginseng, antler, cordyceps and so on. As for some tricky disease, people in need may find effective cure in this shop. Chinese Photo Studio is skilled in shooting personal portraits. With a far-reaching history, this studio enjoys a high reputation for it has served government heads and leaders of generations. Beijing people are willing to choose this studio to take their wedding, family and birthday photos. Stepping on the street, one will find the Malls at Oriental Plaza easily. The mall consists of seven differently themed shopping areas, which meet the demands from different economic status. What to buy here in Beijing Wangfujing Street? Fashion clothes, handbags, perfumes, wrist watches and cosmetics from world famous brands are all in your choice! This mall is quite popular among young people. The bookstore is ten storied. It provides a wide selection of books to customers. Every book is original, so they are sold at full price. One can also enjoy reading inside for free. Meanwhile, some crafts and traditional music instruments are displayed for visitors. The restaurant is first opened in 1903, which was famous for mutton hot pot. Nowadays, it possesses about 200 kind of cuisine style. Just in one restaurant, you can taste authentic food from all over the world. Quanjude is the most famous roast duck restaurant in China. Once people reach Beijing, they would like to taste the original roast ducks. Therefore, the branch restaurant at the commercial street is a superb choice. In the south of Haoyou World Mall, one of the most popular Wangfujing shopping malls, there is a street with hundreds of snack stands and shops, which mainly sells nationwide snacks, tourist souvenirs and folk crafts. On the first floor visitors can enjoy over 500 kinds of foods from every corner of China, such as kebab, sugar-coated figurine, tea soup and Tortilla Flat. Foods on the second floor are mainly Muslim-flavored, where the best beef and mutton are provided. On the third floor visitors can enjoy the exquisite tea and wine with Beijing opera for leisure. After the Wangfujing Night Market (Donghuamen Night Market) closed, this street becomes the most popular snack street when night comes. 3. Currently, Beijing has adopted tax refund policy (Value Added Tax or VAT) among overseas tourists, and there are several designated tax free stores in the commercial street, including Gongmei Mansion, Wangfujing Department Store, Dong'an Department Store, and Wuyutai Tea Shop. 1. Take Subway Line 1 and get off at Wangfujing Station. The Exit A leads to the commercial street. 2. Take bus 41, 52, 120, 140, Night Bus 1 or 17 to Wangfujing; or bus 103, 104, Te 11, Sightseeing Bus 2, Night Bus 18 or 21 to Wangfujing Lukou Bei. How much taxi charge from Beijing South Railway Station to Wangfujing street? It will cost CNY25-30 in the day time. We would like to visit Wet Market in Beijing Qianmen Street , Pedestrian Area. Buy some things or products for us to eat and to bring back home. Is there any Wet Market around Qianmen Street ?? As I know, Xiangchang Road Community Vegetable Market is about 700 meters from Qianmen Street. It is located at no.3, Huayan Road, Xicheng District. Thanks again Jack from United Kingdom ..
Why I got answer all the way from United Kingdom ?? Can we find any 3 star hotel in Beijing Wang fu jing street? We thought of just staying nearby . Can you recommend a few ? Here are some economical hotels. Hope these will be helpful. Tqvm for your timely information . 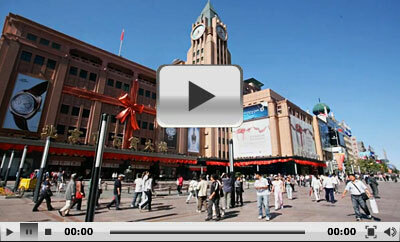 is there any wet market around Beijing Wangfujing street? Yes, there is a wet market near the street. It ‘s located at no.14, Xila Hutong, no.53 Dong’anmen Street, which is only around 0.6 miles (1 kilometer) away from the street. You need walk about 870 yards (800 meters) along the WFJ Street. Then turn left to Xila Hutong for about 220 yards (200 meters) to the destination.